All Quiet on the Martian Front: Ridge Line North Prairie, Minnesota. Ridge Line North Prairie, Minnesota. Scenario: A variation of Scenario 1 "The Outskirts", Ridge Line North Prairie, Minnesota. Marvin's Martians: A total of 11 tripods, 7 Assault, 2 Grenadiers and 2 Scouts. About 2,000 points. 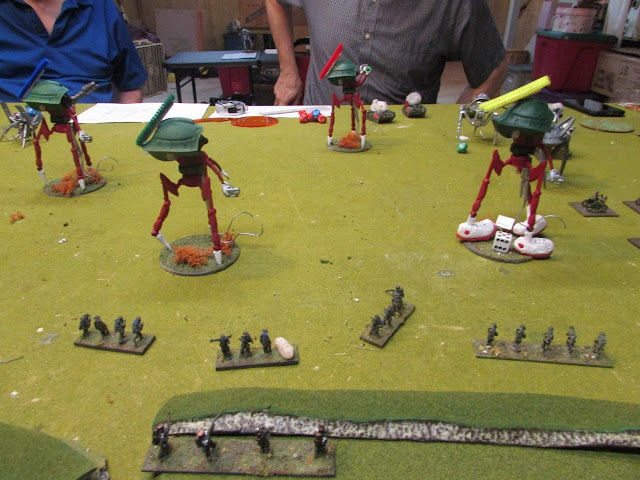 The American 61st Regiment, 9th Brigade, 5th Division (Major General Charles H. Muir commanding), is continuing his mission to clear the Martian from central Minnesota. All the American Infantry has been dug in on a ridge line near North Prairie, Minnesota. They deployed as 14 hidden movement counters, aka "Blips." The armor is all in reinforcements and arriving on both the left and right side of the board starting on turn 2. 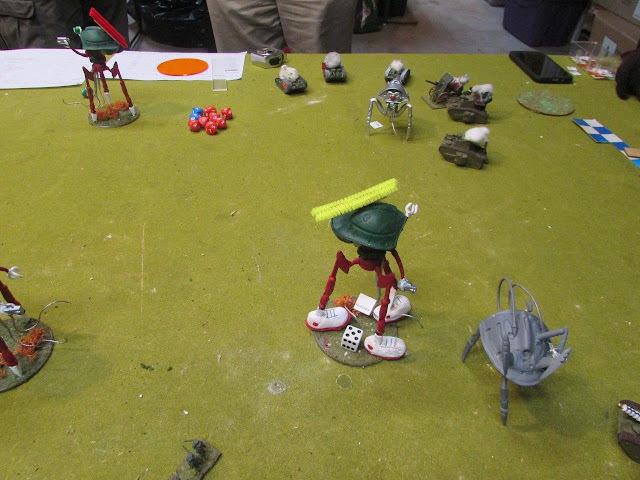 Martians Deploy in the opposite edge of the board. Just looking for who breaks first here. The break point is 11 American units or 6 Tripods. A word from my sponsor is at the bottom of the report. "General, a word if you will." "General, I believe this plan is flawed. There is too much open ground here. There are still many uncut forests around here to use as terrain. We should take advantage of that." "Noted Colonel. I agree with your reasoning. However, there is a point where we will not have that advantage, and we need to learn how to fight the Martian without terrain. We are on the offensive right now. Most of the territory they own is the great plains. Have you ever seen Kansas?" "Utterly flat for hundreds of miles. The only terrain in sight is the horizon. That is why we need to learn to fight the Martian in the open here. While we have some terrain to fall back on while we are learning." "Is the 60th regiment in position?" "Yes Sir, Colonel Jenkins assured me plenty of covering fire to retreat through if things go poorly for the 61st." "They have seen us sir. Of course they would have to be blind not to. With fireworks and bonfires going off for the last 3 days." "I thought that would get their attention. We took the high ground of the area, and dare them to attack. Just like General Meade at Gettysburg." "Yes Sir, but Pickett didn't have heat rays and black dust." And here they come. 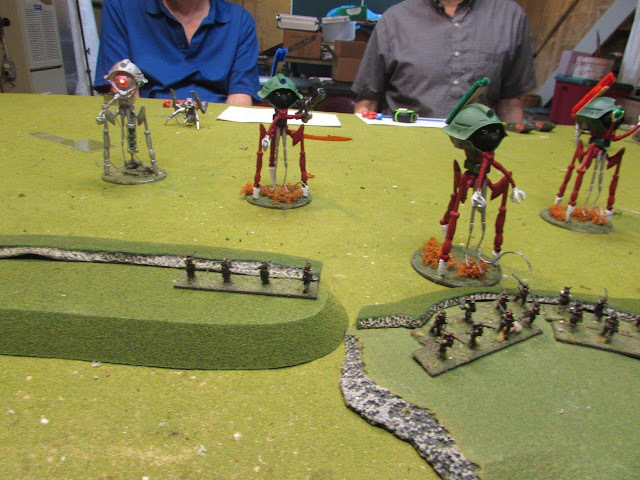 On the right, 3 Assault Tripods supported by a Grenadier and a Scout. On the left, Marvin's Martians, code named Marvin, Huey, Dewey and Louie. 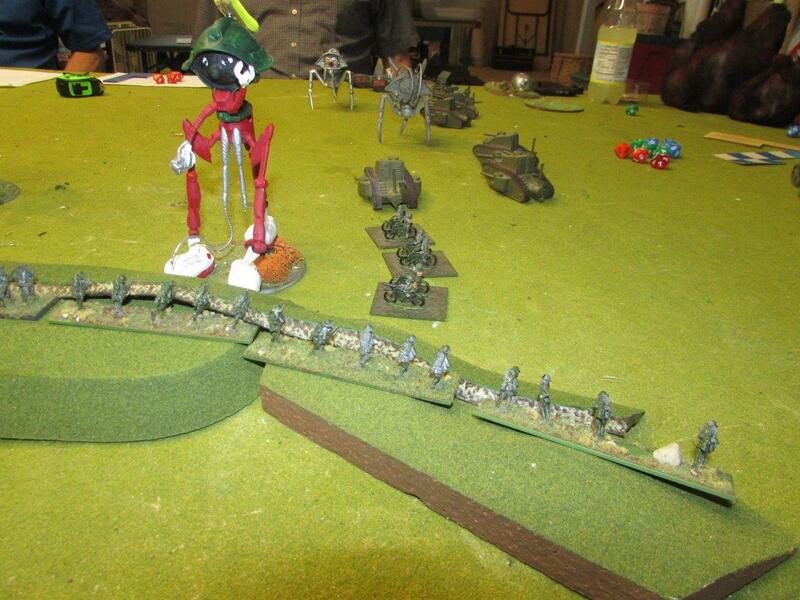 Also supported by a Grenadier and a Scout. But with substitution tripods due to some late casualties in the figure mix. On the American left, in entrenched positions, are Blips 1-5. On the American right, Blips 8 -12. 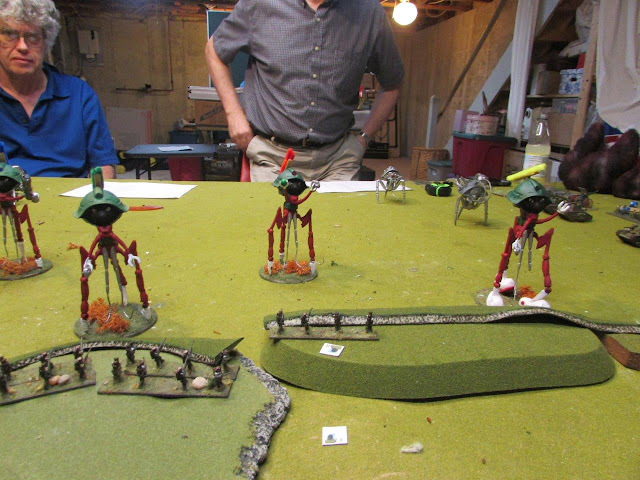 Scenario rule, the Martians have the initiative and elect to move second. From the American side is crickets. The Martian right surges forward. 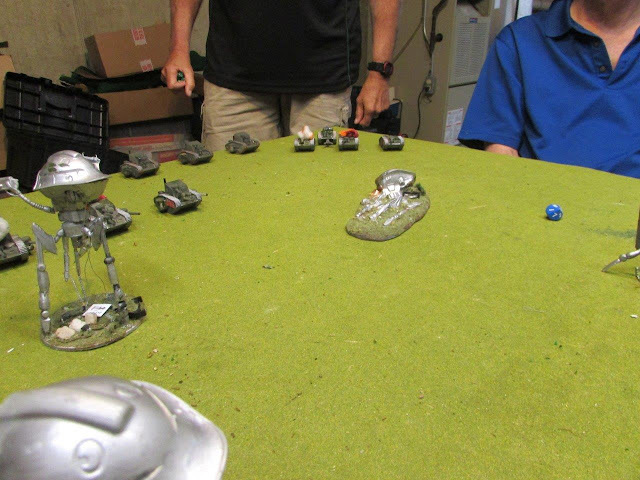 Revealing the American MG Company, Then destroying two platoons, causing the third to rout. 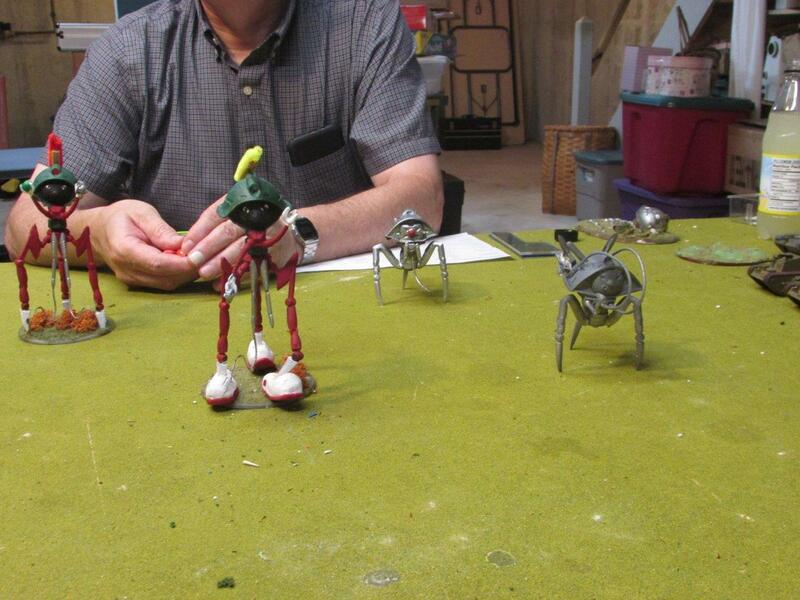 Marvin's Martians also reveal an Armored Infantry Company. On the second move, the Martians push forward to the 6" range where Blips are auto revealed. The American line looks thin. The Americans win the initiative and elect to move first. There was some thought about this. 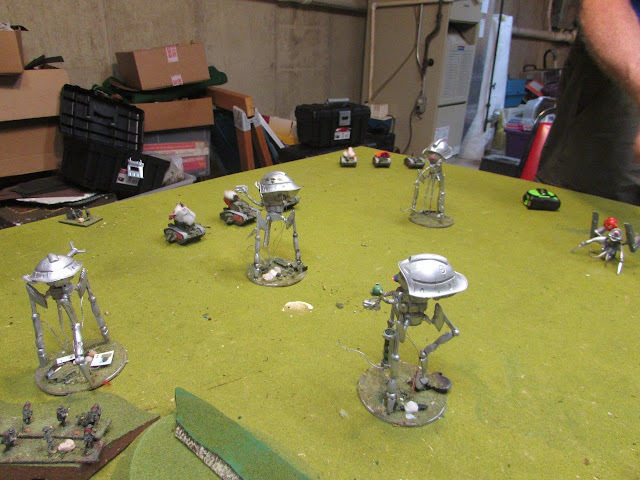 If the Americans let the Martians move first, there is a chance, albeit small, that the Martians can rout 4 of the infantry units, which would be an automatic win for the Martians. But then this also means the Martians can only shoot at infantry and not tanks, effectively wasting their shots on poor quality targets. 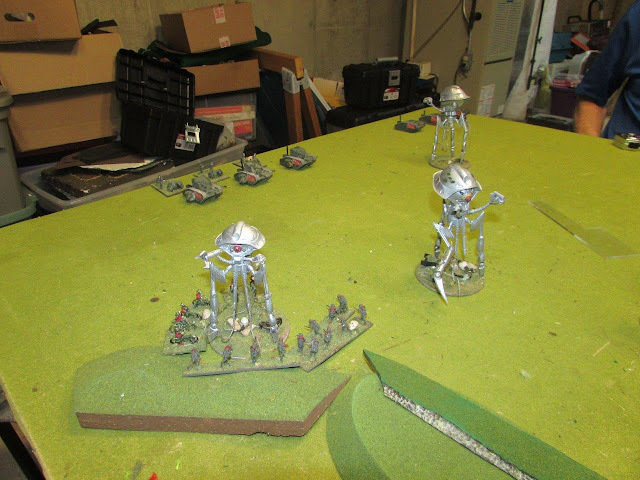 The Americans decide to move first and bring on their armor. Rough Riders entangle the Scout Tripod with a tow cable. It is then assaulted for 1 damage point. Mk III's arrive, with field guns in tow. Both Armored Infantry Companies assault Louie, but to no avail. 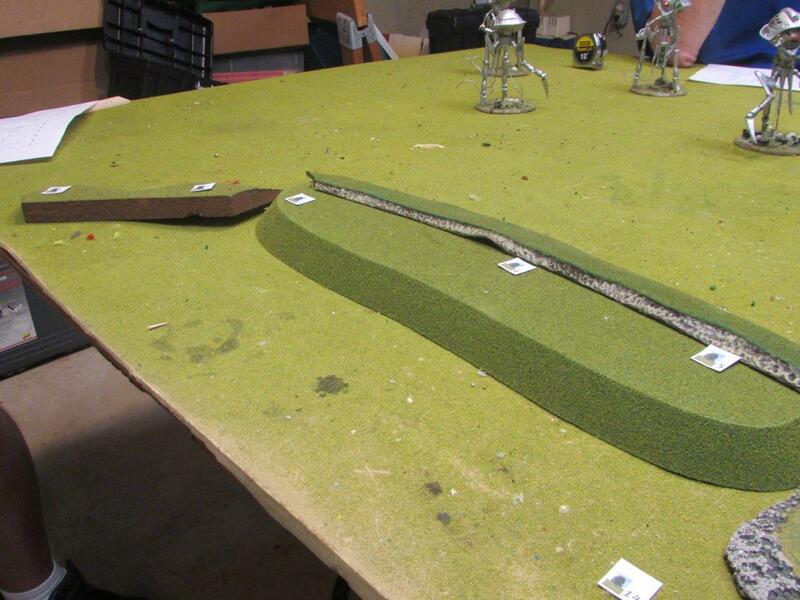 The rest of the infantry is revealed and fills the trench line. In the distance, all the American Armored forces come on, sans the Tesla gun. But only the furthermost Tank Company is able to shoot. 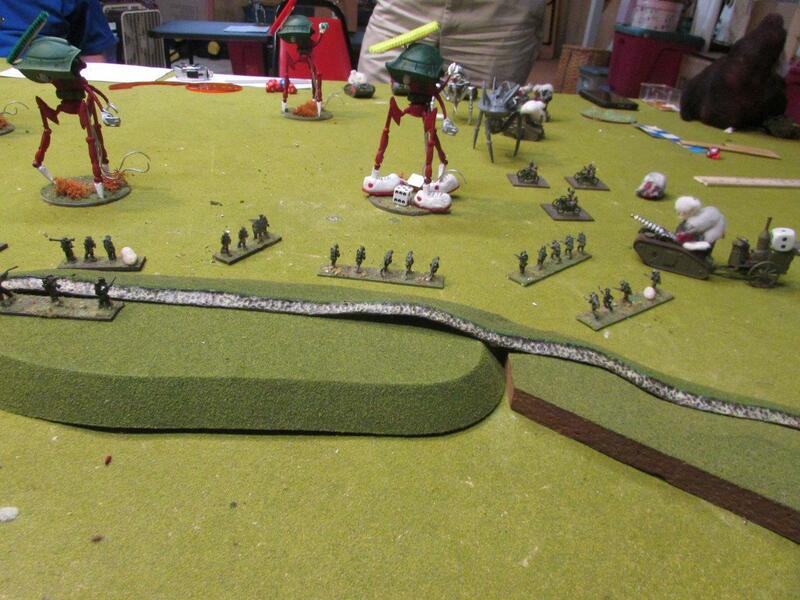 Damage done, the infantry retreats to its trenches. In the trenches, the infantry is very difficult to hit. Requiring 9's to hit, and 6's to kill. 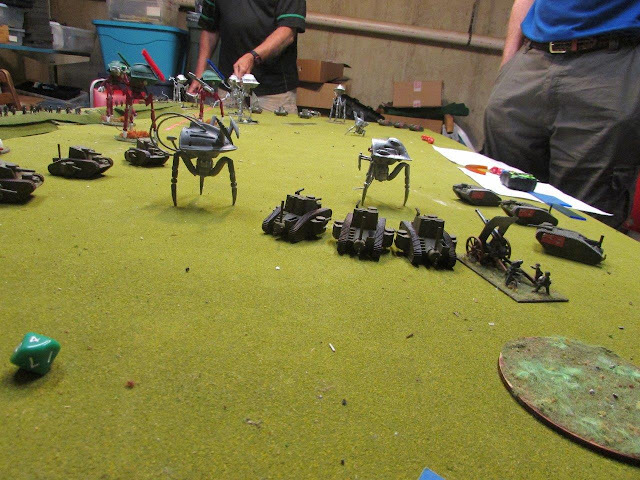 In the center, the Armored Infantry, is also immune to black dust and green gas. The view from the short edge. The Martians respond quickly. Flaming many tanks and the field guns. Using American Industrial Might, they spend two order chips and restore a unit of Mk III's. 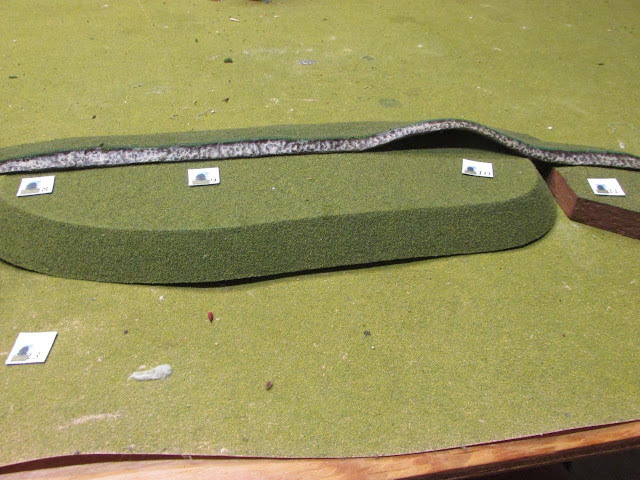 But they failed their reinforcement roll and remain off board. But other American forces flood the flank. Damaging a tripod. Marvin is entangled by tow cables. Marvin's Martians burn tank and guns. Mk II's in the distance, the Anti-Tripod and the Tesla gun. With a +2 for initiative, the dice were 1 to 3, or a tie. 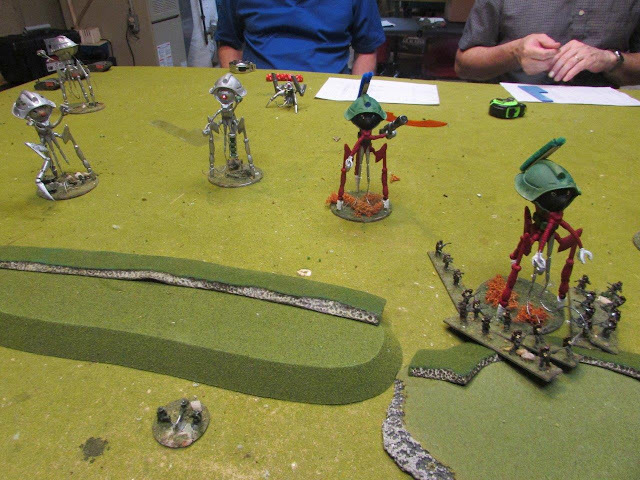 But the reroll was 9-5, so the Americans continue to hold the initiative and move first. 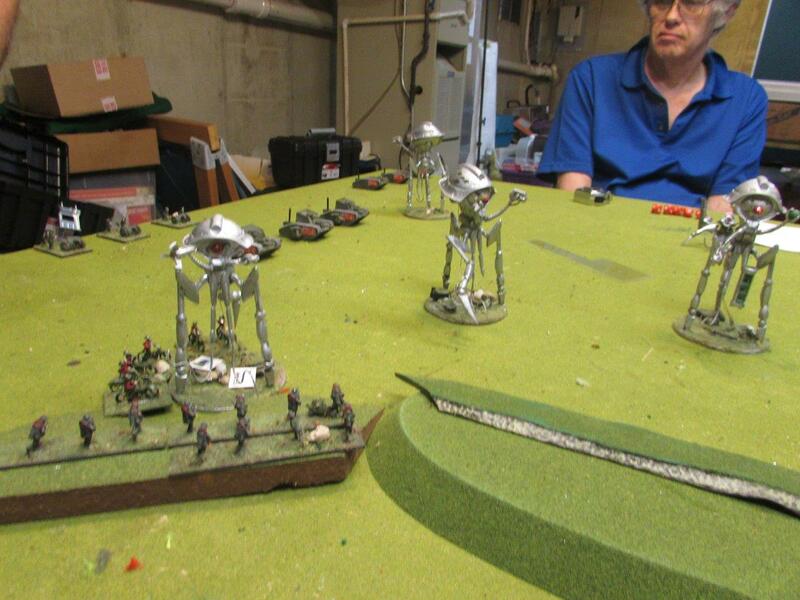 Using American Industrial Might, the Americans spend two order chips and restore another unit of Mk III's. 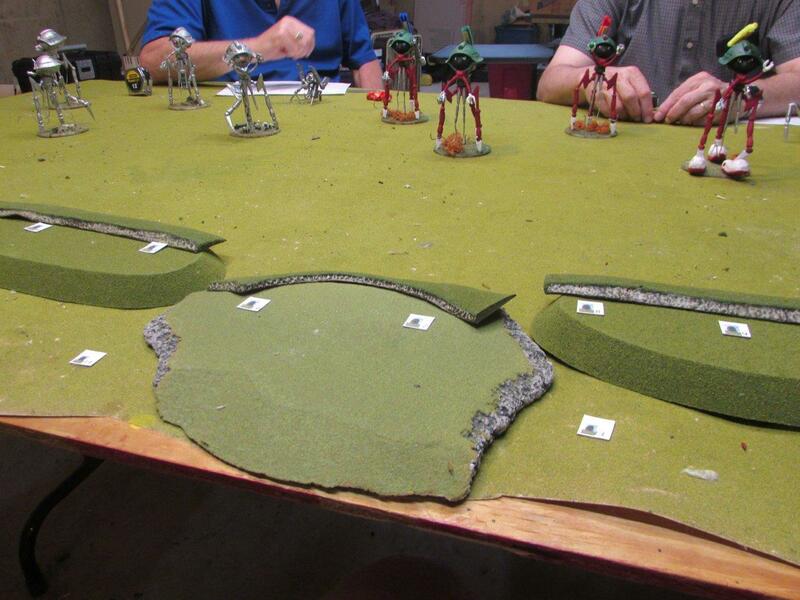 But they failed their reinforcement rolls and both companies remain off board. 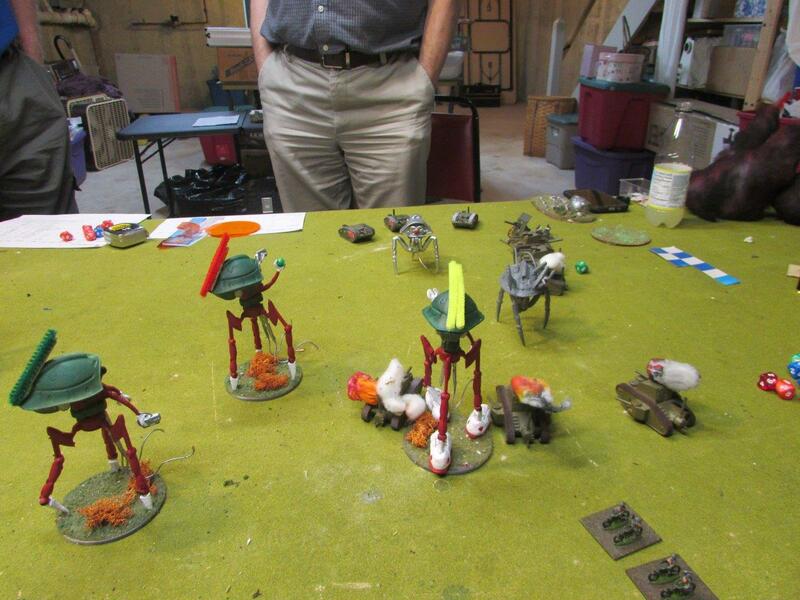 On board, there are early victories as two more Tripods collapse in heaps. 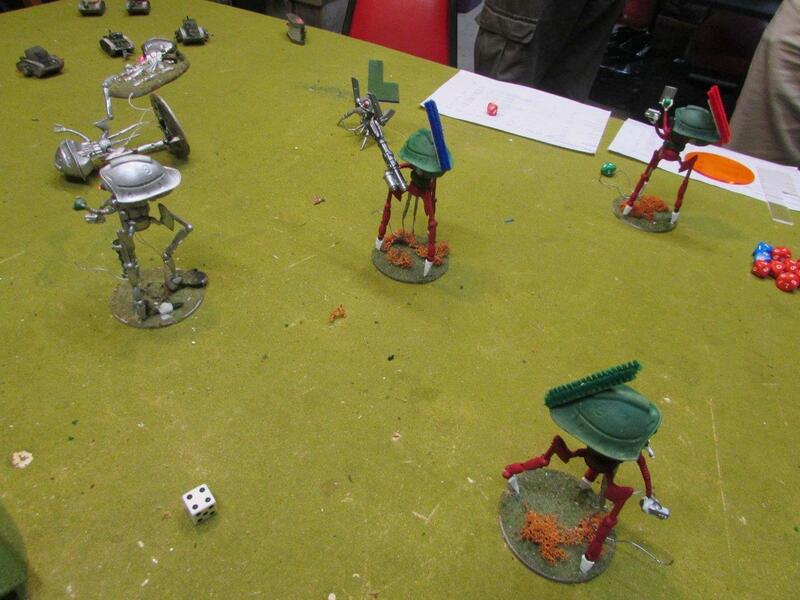 The Martians have lost 3 Tripods, 6 is their break point. 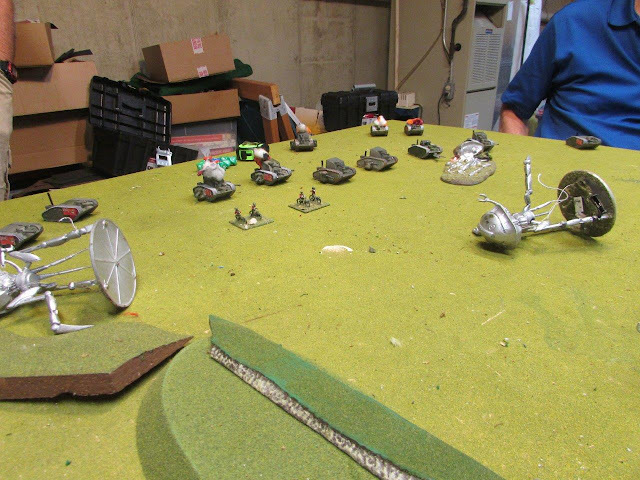 The Americans have lost 7 units towards their break point of 11. Marvin was further entangled with tow cables for a total of 5. 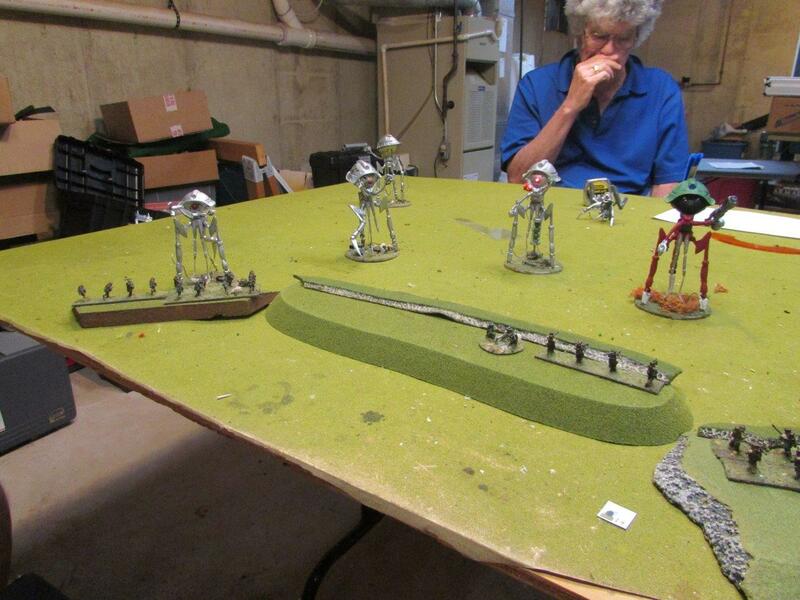 The Americans spend a pair of command points and double time their infantry from the trenches for a close assault. But only score a mobility hit on Marvin. 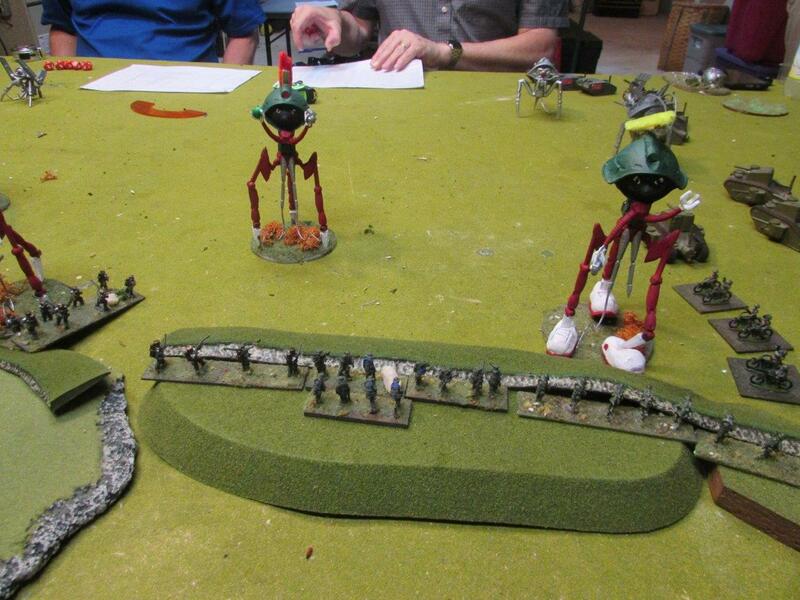 The Grenadier Tripod, with a Slaver substituting, has taken the brunt of the cannon fire so far, and has 5 hits. The Americans have taken their chances, but now are on vulnerable ground without much to show for it. Rough Riders are rudely handled by shock canisters. 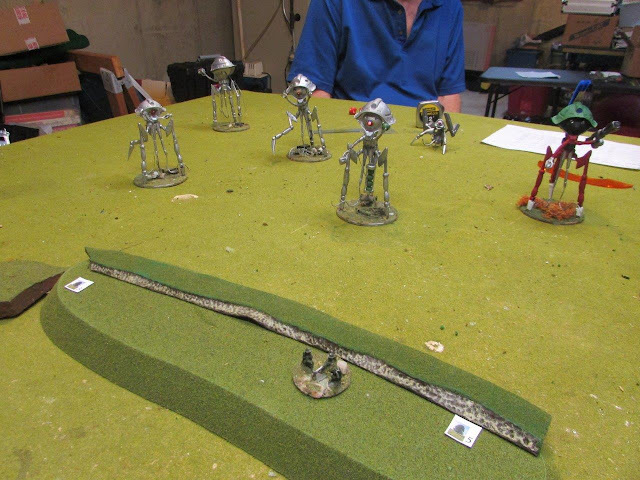 Americans have plus 2 on the initiative roll, but lose it anyway. The Martians will move first. 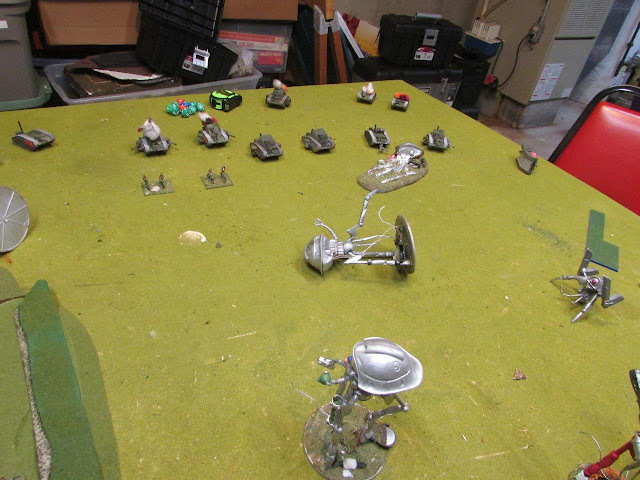 Marvin finishes off the Rough Riders, Huey finishes off the Mk II's. The Americans have lost 9 units towards their break point of 11. 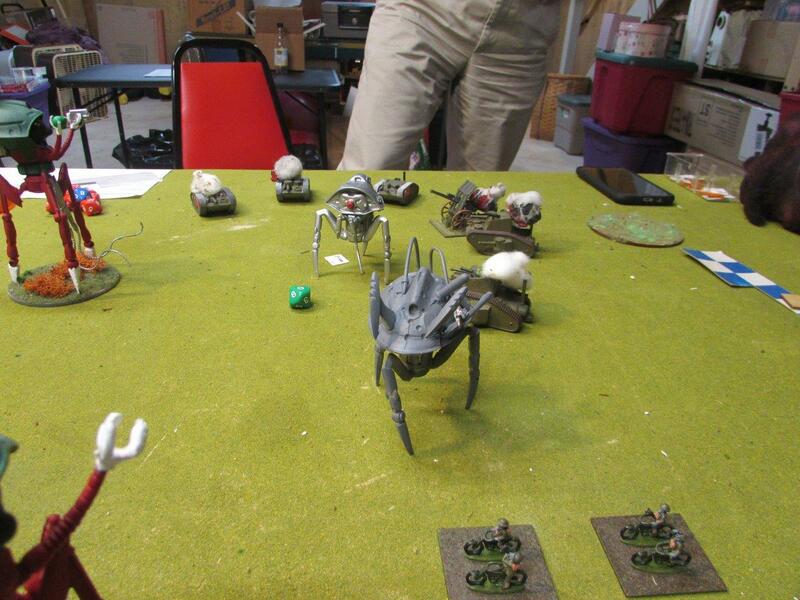 Dewey knocks off the last Mk on the other flank. Raising the American breakpoint to 10. 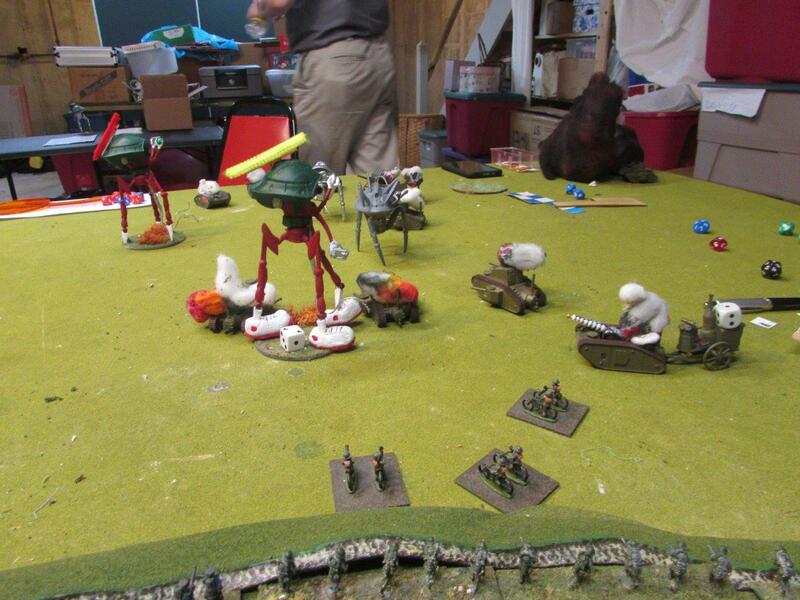 While incoming Grenadier fire finishes of the last Mk III of another company, routing the Americans. The message from the Aberration was clear. Another victory, humans in rout. But no pursuit. The humans were allowed to run away unharvested. आपका भविष्य watched the video screen. 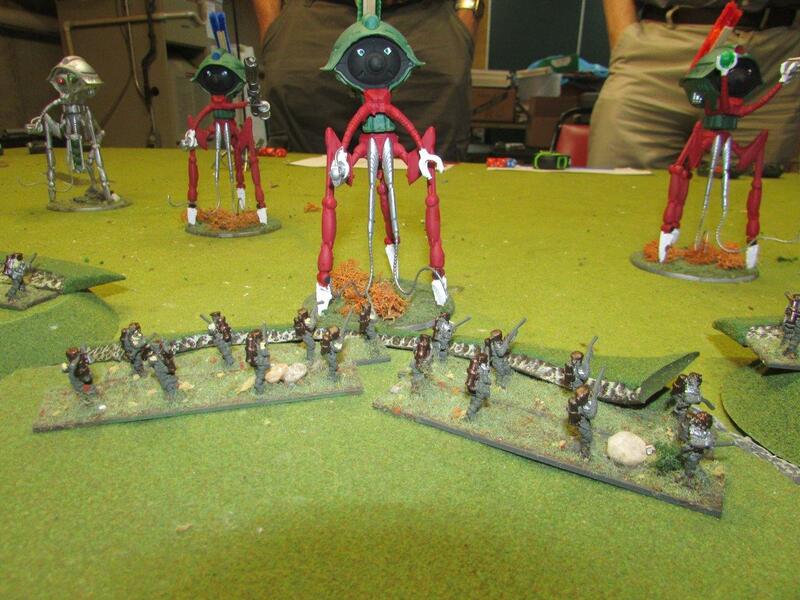 Only one of Pod 5's War Machines returned, the rest were the outlandishly colored War Machines of the Aberrations. Way back in the distance, limping to keep up, were two of the projector machines. 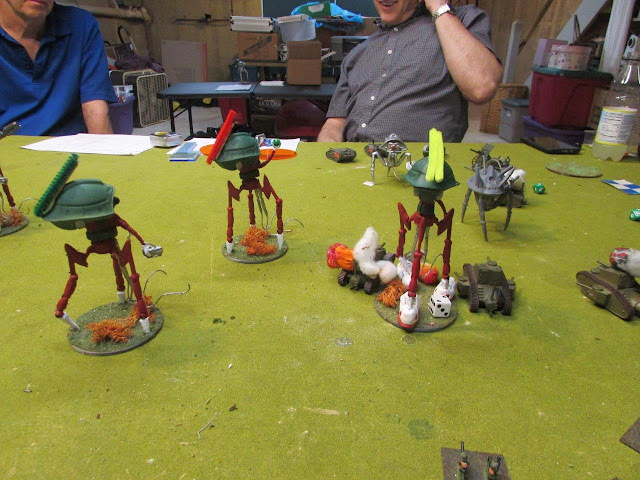 3 more dead Martians. But numerous (and uncounted) human warriors and machines as well. आपका भविष्य didn't like the math. After their last defeat, the humans recovered too quickly. They practically dared us to attack. Defeated again, but they are still here. Gone were the days we would pursue them all day and night. He replayed the telemetries again and again. Why did the humans deploy as they did? What was their thoughts? And finally he saw it. And the risk they took, and the gain they almost had. No longer are the humans just trying to avoid defeat, this tactic was going for the strategic win. 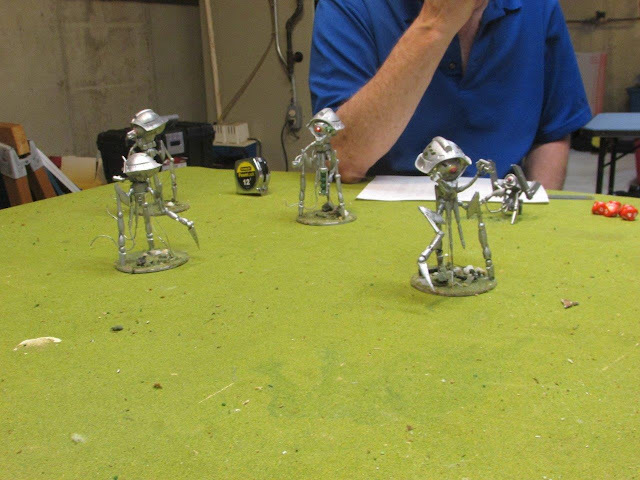 With just a little more force here or a bit of luck there, then all of his mobile forces would have been destroyed, and with it, Pod 5 would be defenseless. He checked the statuses of his maturing buds, the war machines were ready, just needing pilots. Well I see your gambit humans. Let us see if you like it as well. This is not AQMF related, but I think I have enough credibility with you to diverge for a bit of crass consumerism. 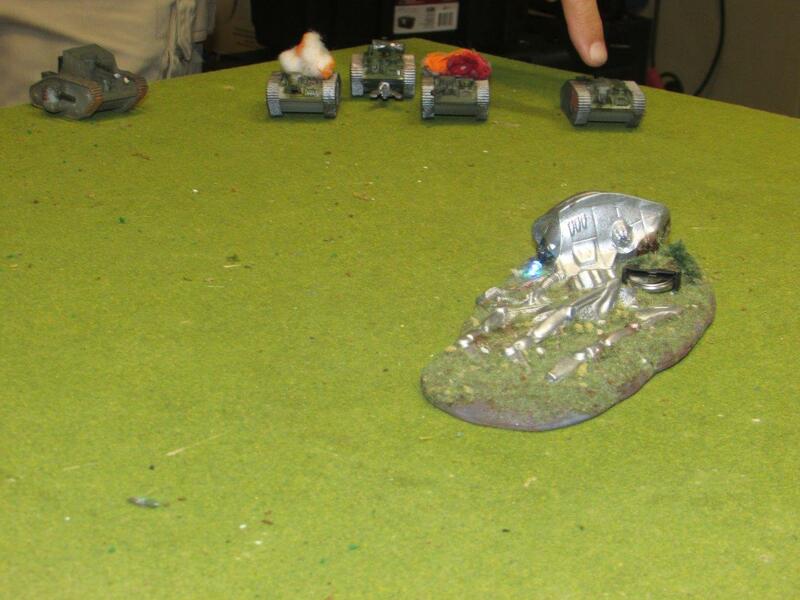 Many of you know that I have a business relationship with the company, Lost Battalion Games. This has been on and off for the last couple of decades. I want to announce their latest game on their Daring Play site that I personally have had development time with, Traveller Ascension, Imperial Warrant. The game is being demonstrated at Origins so I am no longer required to be silent about it. The short of it is, this is a great game! I have not had this much fun playing a new game since the world was young. It is during the expansion period of the Third Imperium. You represent a faction of Nobles and Corporations that have an Imperial Warrant to expand the Imperium. From a world on the edge of imperial space, you focus your resources of wealth, Diplomats, Shadow Agents, Scouts, Starships and Troops. Your goal is simple. Bring developed worlds, lost in the 1,000 years of the long night, back into the Imperium. But there is a catch. The Emperor requires that this be an honorable endeavor. He is interested in planets that can stand on their own, and not a empire of slaves. So your efforts must be one on improving the lot of the lost planets, not one military conquest. To start, you lay out the sub sector of stars. Each star has a system that connects to six other points of the map. 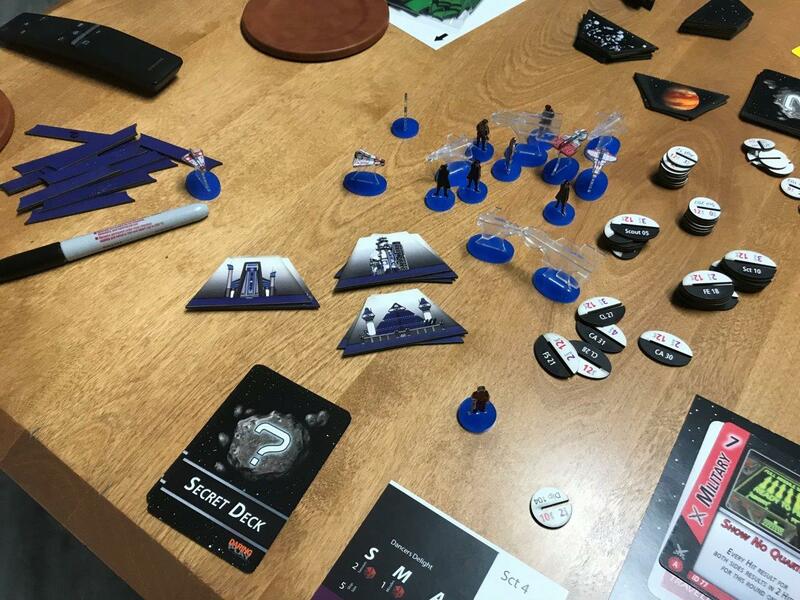 You explore the stars via a combination of scouts, which discover the quality of the world present, rated A-D. Then you send in a Shadow Agent to conduct "Planetfall". This determines the major societies present, tech level and resources. Finally you make official contact with a Diplomat, and make arrangements for a Legation. Once official contact is made, you can initiate a series of trade deals and system improvements until the time is ripe to bring the system into the Imperium. Note: The below pictures are from the Beta test version. The final version is out now, and I'll have better pix next week. Mid game, a partially filled out map. Bottom left is the entry port for one of the Noble/Corporate entities. Upper right is the entry port for the other. Meanwhile, your opponent is sending in Assassins, Pirates, Starships and Troops to prevent this from happening. Or worse, bringing the star system into the Imperium under his Corporate/Noble banner instead of yours. Play starts with each player drawing 8 cards. These cards determine which resources can be used for the next 6 rounds. They can be Military, Diplomacy, Shadow, Science, Economic or Movement. Each only allows specific actions that can be applied. 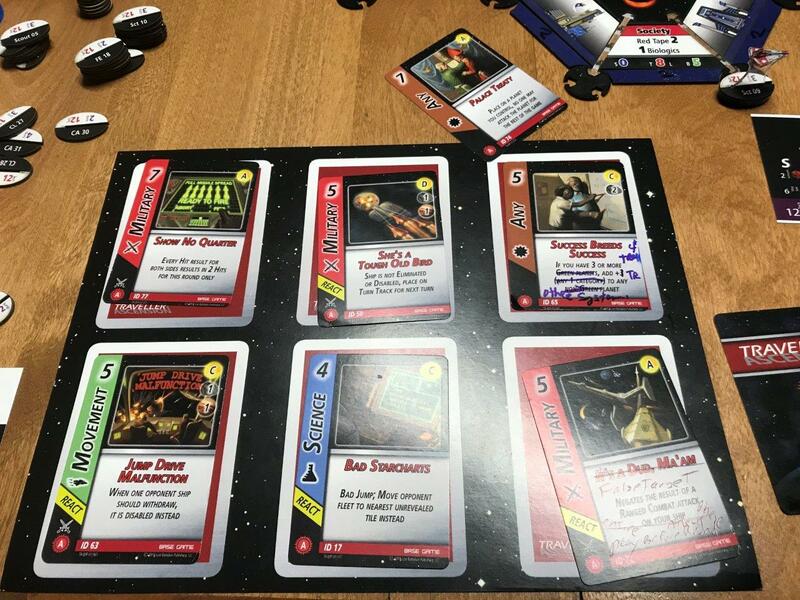 Cards also have events that can be played in lieu of your normal actions, and some can be played in reaction to other events on the board. Furthermore, certain corporations have the ability to focus more in some Tasks over others. Mostly only two task types can be performed per turn. So on the board above, this player had 3 Military cards, so his corporation must have a military focus. The game comes with a number of playing pieces. Representing your Agents, Fleets, and Legations. Each unit is different, in that some Agents will perform some tasks better than others. But be ineffective in still other tasks. Shown above are "Bars" representing trade a power. The Legations Embassy, Factory and Military Base. The black and white card is for one of the scout ships. Each ship is different. A deck of secrets. What is in there? Your Diplomats and Shadow Agents will have to adventure for them. The black and white pieces are sliders to place on you pieces to identify them. 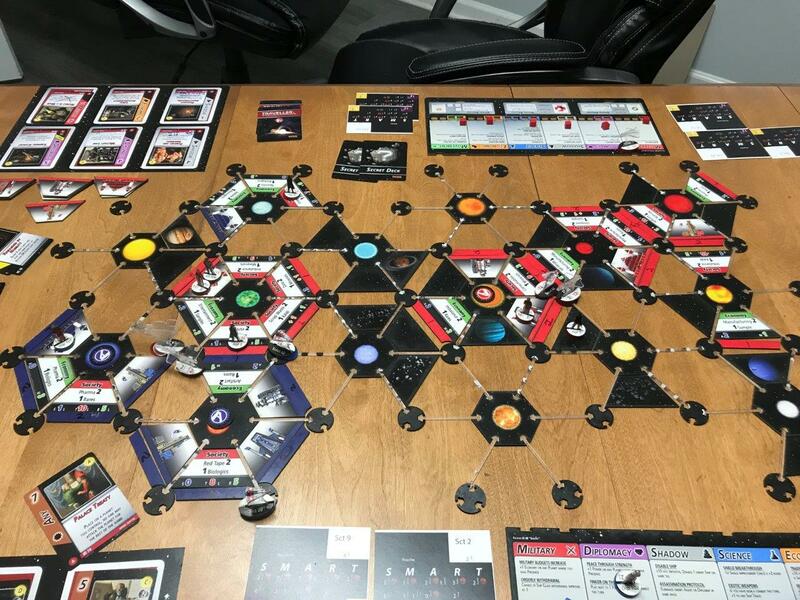 The game runs 10 turns which takes from 2-2.5 hours. Officially licensed by Marc Miller, the creator of Traveller. Great fight, and I love your version of the Red Martian ! The Marvin the Martian paint scheme is brilliant. Marvin's story started with a conversation with my wife. 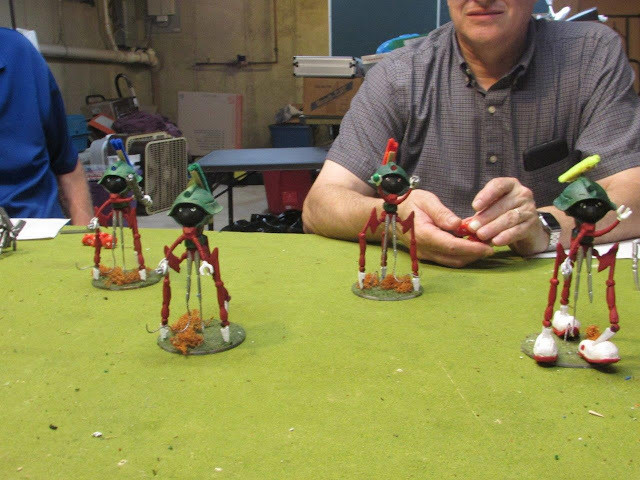 She asked me if I would paint a tripod to look like Marvin the Martian. My facial expression must of been weird because she thought she offended me. I then responded with "How can I NOT paint one like Marvin the Martian." 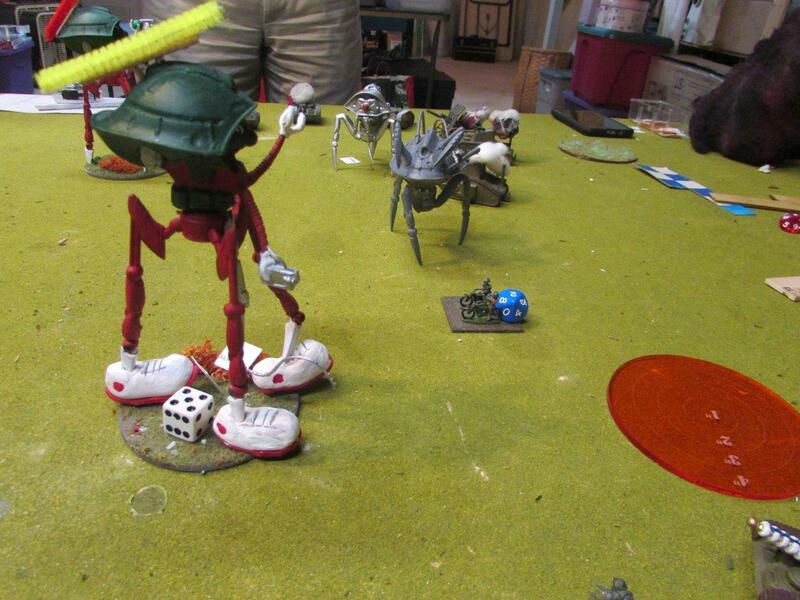 It was only later that Steve Turn pointed out the text on the Red Martian in the rule book to me. Marvin gets around. Wasn't he in Michigan just a battle ago? Canada! Michigan was just a way point. 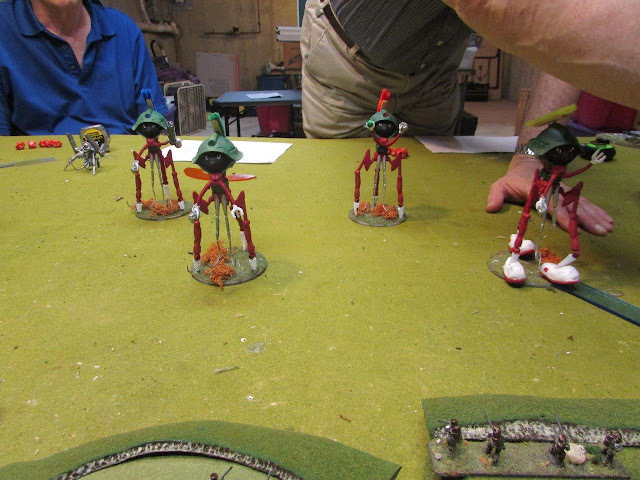 He stole a scout tripod and ran back to Hive 2B, there to stand in judgement for his crimes.